Before starting your farm-visit-program, prepare a checklist of everything you will need to do in advance, and what you need to take on the day. The following checklist for planning the concrete procedure will ensure that nothing is missed. The priority of this chapter is in planning a proper operation and organisational framework of the whole visit – from saying welcome to saying good bye. Examples for concrete content-based farm activities you will find in modul 3. It is often advisable to talk to friends and colleagues about your ideas, as some of them might have experience or know people who could advise you in the run-up to the event. 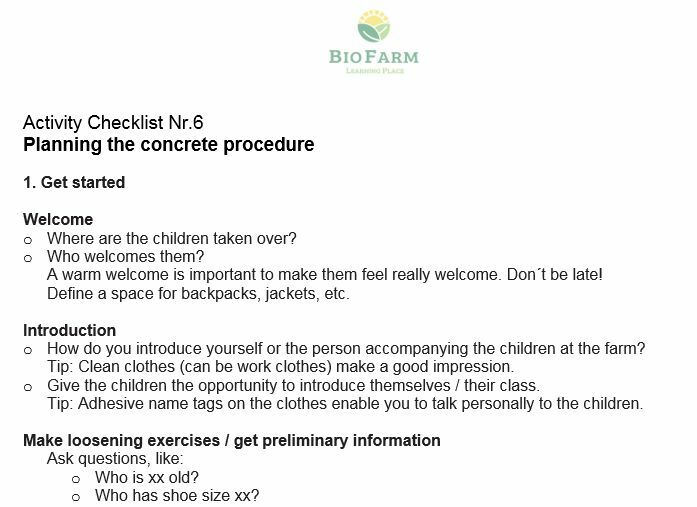 When the concrete procedure of your farm visit is fixed, think of, what is needed to be prepared for the visit (e.g. educational material, signs, snack, lunch…).